I have the privilege to attend the Cold Eyes Movie Premiere on 30 August at Marina Bay Sand with Iceprinxess. Thanks to Purple Plan Organization that I won a pair of tickets. We even get to catch the stars walk down the red carpet and see them on stage at the theatre. We went to Marina Bay Sand to collect our tickets at 7.30 and waited at the waiting area after that. It was a long waiting time for us as we were barricaded by the security guards. There were many fans standing around the area, even aunties and uncles were there to support the Korean artistes. The MC of the day is Li Yi from FM 93.3. While waiting for the celebrities to come, she tried to engage the audience by having small talks with the fans and even gave out posters for the Q&A games. However, she failed to hype up the atmosphere and engage the crowds who were anxiously waiting for their favorite stars. It was only around 8.20pm, the local celebrities and invited guests started to grace the event. It was followed by the long awaited Korean celebrities and the director who walked down the red carpet around 8.30pm. Fans were screaming as the celebrities smiled and wave at the crowds. We managed to take pictures and video of the celebrities as they walked down the Red Carpet. We were seated down at the theatre at 9pm after a fast security check at the entrance. We were able to locate our seats easily and get ready for the Movie Premiere. It was only until 9.30pm, the Korean celebrities came on stage for some interviews. After a 10 minutes interview, the movie started and we hear screams of excitement around us. The beginning of the movie introduced us to Han Hyo Joo who stood in at a corner of the train observing an old man who behaved suspiciously. Wow! What a great way to advertise for the Acuvue colour contact lens, when the camera zoomed into her eyes which showed her brown contact lenses. Back to the story, it seems like Han Hyo Joo is on a secret mission as she trails the man from the train station to the streets. Amidst all the trailing, a crime was happening at a bank nearby. On the other hand, James (Jung Woo Sung) was seen holding a binocular, while he stood at the rooftop of a building observing a crime which took placed in a bank. He was calculating his move and coordinates the operation as he listens to the conversations of his accomplices. It turned out that he is the mastermind of the criminals and he could not tolerate any mistakes and will get rid of anyone who jeopardizes his plan. He even used a sharp pointed pen as weapon and ruthlessly kills his victim by stabbing the neck and the stomach. James is the leader of an international crime ring who is extremely meticulous in his every move. Han Yoon Ju (Han Hyo Joo) was recruited as a new detective in a Korean Police Forces Special Crime Department that specializes in surveillance activities on high profile criminals. Due to her sharp observation skills and photographic memories, she passed the test with flying colours. However, she has the habit of tapping her fingers as she tried to recall the events in the stored memories of her brain. Her nickname in the special squad is piglet although she wanted to be called reindeer. We were introduced to the ace detective of the special squad team and he is none other than Daramjwi (Lee Jun Ho) whose nickname is squirrel. He earned the title of Ace in the team because he is able to complete the missions given to him. The chief detective Hwang Won-jin (Sol Kyung-gu) leads his team as they attempted to crack the case and arrest the ‘shadow’ James. However, it was a tough job to arrest the ring leader and they needed proper planning to achieve their goal. With the authorities on James tail and the betrayal of his own organization, how is he going to survive? Is he going to be caught by the police or killed by the crime ring master? 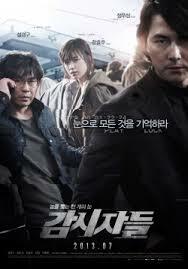 ‘Cold eyes’ was a box office hit in Korea cinema even before the Asia tour. After watching this movie I can understand why many people were attracted to this film. I personally like the way director Cho Ui Seok handle the camera and the way some scenes were shot. He is able to capture the dynamic feel and the angle of the scenes with style. The effect was better in the wide screen, especially how he shot the streets and passing vehicles from the top which gave us a beautiful view of Seoul. The scene shows how James looks at the crime scene from his angle at the rooftop. The storyline was interesting and a typical game of cats chasing a big rat. Throw in some actions and sound effects and we have a decent story to tell. Basically, there are nothing complicated about the storyline and no romance in the air in case you are expecting that. Most of the time the story focus on trailing the suspect and finding out who is the leader of the crime ring through various ways, such as CCTV etc. Talking about the cast, I was impressed with the charismatic actor, Jung Woo Sung. His screen presence was great whenever he appeared in the movie and he did a decent job in playing a cold-hearted leader of an international crime ring. This was the first time he ever acted as a villain and I got to give credit for his good performance. The other actor that impresses me is Sol Kyung-gu who acted as chief detective Hwang Won-Jin. As a veteran actor with many years of experiences, he had mastered the skills needed to portray a character in a story. I liked the way he leads his team with wisdom and his interaction with Han Hyo Joo which was both hilarious and sincere. Han Hyo Joo was great as a rookie detective and I know that she cut her hair short to match her character in this movie. She wore the same expression throughout the show, except for some dramatic moments such as the murder of Squirrel and her desperation to find the mastermind (James). There were some moments when she shines as an actress, although she can do better. Generally she did pretty well for her role. Lee Jun Ho from the top idol group 2PM made his first debut as an actor in this film. It was a good attempt for him to be exposing to acting and it take some experience to build up his acting skills. I would say that he look cute and handsome with his smiles. Most of the time, he just gave his signature smiles during missions and he demonstrated his potential in acting when he was stabbed by James. Overall, I would recommend this movie for fans that enjoys action movie and some thrilling moments. Just be prepared for some bloody scene and you would have no problem seating through this movie. I haven't watched this movie yet I was changing my spectrum internet packages but now I got new charter spectrum connection now I am gonna watch it online. This movie seems very horror and different from others I just got frightened only by watching its trailer the complete movie gonna rock my world.